In India, plants are worshipped as Gods and Goddesses. Many plants such as Holy Basil, Banyan, Peepal, Banana, Mango, Neem etc are considered as the sacred one. During festive occasion, leaves of mango and banana tree are regarded as the sign of purity and good will. Many person thinks it as backwardness and superstitions, but these are not so. Plants gives us shade, pure atmosphere, fruits, vegetables and greenery which are the base of our living. They are also rich in Health and Medicinal benefits. Thus they are worshipped. 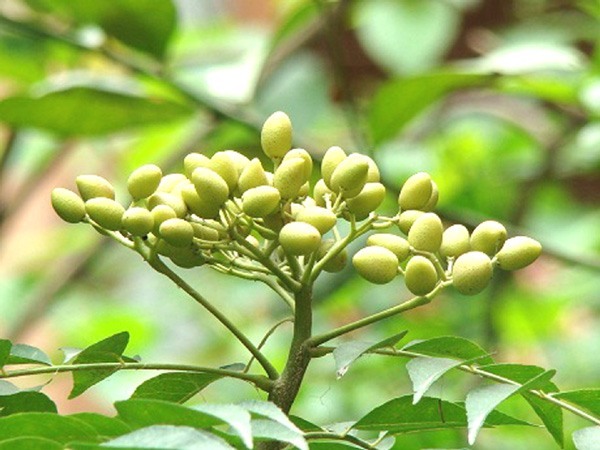 Well, here we will be talking about one of the prominent and sacred tree called “Neem or Margosa tree”. Just by hearing the name ‘Neem‘, a portrait of purity, wellness and health comes to our mind. As per Hindu text, it is a known fact that it is harmful to sleep under a tree during night. But this tree does not hold any kind of this property; it is always pure whether it is day or night. At night, all the trees release carbon dioxide but Margosa tree releases life providing, life saving and disease curing gas. Actually, Margosa tree is known as the magical tree on eath. It cures all types of disorders. Margosa trees are 20-30 ft tall and evergreen. The bark of the stem is rough in texture and brownish. It bears dark green, shiny an elongated leaves. The leaves tastes bitter but is very good for health. Each branch has new leaves which are slightly curved and are shiny from the top. It also bears white coloured fragrant flowers. When the whole tree is full with flowers; and when slow wind runs then the France is very melodious and soothing. Tree bears flowers from March-May; which gradually gets developed to small, round, egg-shaped and green coloured fruits. The fruit has only one seed which is embedded in brownish pulp. The leaves of neem are used to keep beneath the cloths in order to protect them from foul smell and any kind of microbes. Paste of neem is a good thing for beauty treatment. The tender leaves of neem is also cooked and stir-fried; and used as a curry. Many also prefers to chew neem leaves; it is a blood-purifier. Neem juice is a well know thing for overall health. Now, we shall be moving to the health benefits of Margosa or Neem tree. As said earlier, it is a very sacred and beneficial tree regarded to health. It is used in almost the Ayurvedic preparations. It is anti-bacterial, anti-fungal, anti-microbial, anti-yeast and anti-viral in nature. Neem leaves are highly beneficial to stop nasal bleeding. Grind equal amounts of neem leaves and carom seeds together. Make a thick paste and apply this on ear lobes. To cure baldness and growth of hair, take 1 part of Neem leaves and 1 part of Bael leaves. Grind them and apply on head for 12 hours. Wash off after 12 hours. It promotes growth of hair within 1 month of treatment. 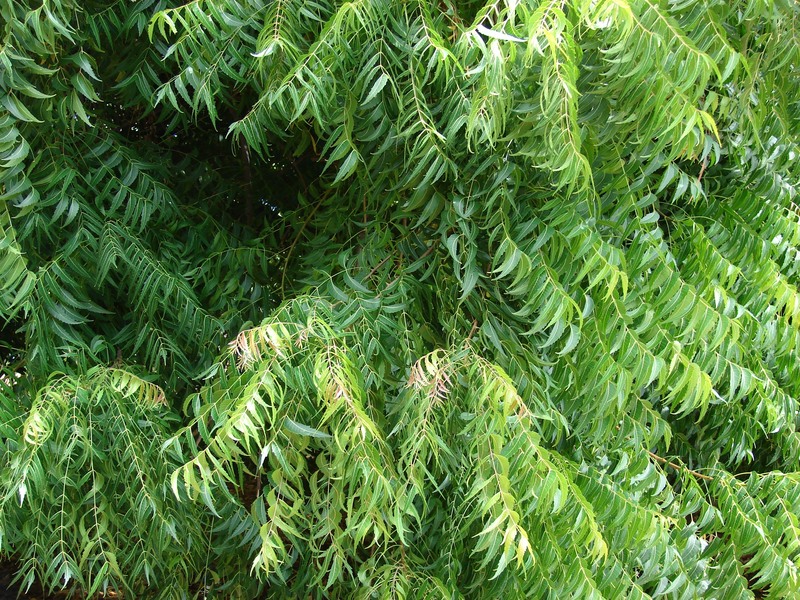 Boil neem leaves in water and then use this water to wash the hairs. It makes the hair strong, turns the hair black, cures boils on head and also treats lice. You can also apply neem oil to cure baldness and any kind of infection or microbial actions on hair. Take 5 fresh neem leaves and 10 gm Indian gooseberry. In case fresh gooseberry is not available, then you can also take dried fruits. Early morning, grind them in fresh water and give o the patient. Also grind the extract of banana with turmeric and cow’s urine. Apply the paste on white patches. Take equal quantities of neem leaves, flowers and its fruits. Grind them in water and make a mixture. Give 2 gm of this mixture with water. Grind 8-10 leaves of neem with curd. Take juice of its leaves and add equal amounts of sulphur, borax powder, nut-grass and black cumin. Grind them all and prepare tablets. On a daily basis, grind a tablet in water and apply on the affected area. Give hot infusion of its inner bark with 4 gm powder of Indian gooseberry, twice a day. Mix powdered black pepper in ghee and apply on the affected area. You can also mix camphor in neem oil; use this to massage on the affected area. It cures even the oldest forms of Urticaria. The green fruits of neem is also called ;niboli‘. Give 6-10 ripe nibolis twice to thrice a day with water. Make a juice of neem leaves with little amount of water in it. add little amount of asafoetida and roasted cumin to it. Have this solution twice a day. It purifies the blood hence cures many diseases. Take 10 gm each of bark of neem and gooseberry tree. Grind them in 50 gm cow’s urine. Strain the solution and mix 6 gm honey in it. To cure fire burns, dip a piece of cotton in Neem oil and apply over the burnt area. It heals the burns and also gives relief from painful sensation. Take 10 gm of its whole plant. Powder it and mix with 10 gm sugar. Take 7 red coloured leaves of Neem and 7 black pepper. Give this to the patient at least for 1 month. It ensures that the patient will not suffer from the similar disease next year. Grind 5-10 of its seeds in water. Apply the paste to the boils of chicken pox. It gives relief from burning sensation. When the patient recovers from the disease, make them bath with water boiled with neem leaves. Apply neem oil on the skin in order to get rid of blisters and dried acne. You can also chew 2-5 leaves of margosa twice a day. IN case of excessive heat in chicken pox boils, grind the leaves of neem and apply over the boils. It provides relief and cures in fewer times. Take 20 gm inner bark of neem and grind it in 50 ml water. Strain the solution and give this to the patient twice a day. Also, prepare poultice of its leaves and tie it. It dissolve the tumour of the plague and lowers the body temperature due to fever. Grind its whole plant and then strain the solution. Give 10 gm of this solution after every 15 minutes to the patient. Spread its smoke around the patient; it is beneficial in curing plague. Take 20 gm neem leaves and 30 gm leaves of bitter gourd. Boil them together in 300 ml water till it reduces to 1/4th. Mix honey in the decoction and give this to the patient twice a day. In Arthritis, massage with neem oil. It is very beneficial and cure the ailment. Grind 20 20 gm of the inner bark with water into fine paste. Apply on the painful area. Remove the paste after it dries and apply the fresh paste again. Repeat this for 3-4 times. Give 5-10 drops of neem oil, twice a day. Grind neem leaves with half the amount of alum. Prepare tablets of 500 mg each. Give 1 tablet with sugar syrup. Not only Malaria fever, but it is beneficial to cure-all kinds of fever. Give 10 gm paste of its leaves to the patient; once to twice a day. Take 20 gm juice of each of neem leaves and Malabar nut leaves. Give this to the patient with honey mixed in it. Give this dosage twice a day for better results. Mix 6-6 gm each of neem stick, coriander and ginger root. Make a decoction of this. It cures burning sensation, sour hiccoughs, indigestion and thirst. Grind neem leaves and prepare a cake. Fry the cake in cow’s ghee till the cake burns. Strain the ghee and eat this with chapati. To cure ye pain, put 2 drops of warm juice of neem leaves in the opposite ear. In cases, there is pin in both the eyes; put the juice drops in both the ears. Take 1-2 gm powder of kernel of its seeds and apply this with eye liner in eyes. With the regular use, it treats cataract. Take dried shade leaves of neem and add equal amount of potassium nitrate to it. Grind them into a fine powder and then strain the powder using a fine cloth. Use this powder for eye liner in eyes. It cures eye inflammation, haziness of eyes, night blindness and other eye disorders. Neem is one of the effective remedy to cure tooth problems. Traditionally, you must have seen many uses the branch of neem as their toothbrush. It is very effective; strengthening your gums and teeth. Take 50 gm powder of bark of its root, 50 gm ferrous oxide and 10 gm rock salt. Mix well and add 3 times of neem juice to it. Dry it and store in a bottle. It cures halitosis, gum bleeding, stomatitis, anxiety etc. Grind them in water; strain the solution and give this to the patient for few days. Take 6 gm each of neem leaves, tinospora leaves, gum leaves and myrobalan. Grind them all and boil in 200 ml water till it reduces to 50 ml. Strain the solution and give this to the patient with jaggery mixed in it. Give it twice a day. It is very beneficial in curing anemia. Grind equal amounts of neem root’s bark, leaves, flowers and fruits. Take 1 teaspoon of this powder and mix it with ghee or honey. Give it to the patient with water or cow’s milk; twice a day. Take 10 gm juice of Neem leaves and add 10 gm honey. Give this to the patient every morning for 5-6 days. It cures anaemia. It has high chlorophyll content thus increases your haemoglobin content. Take 50 gm Neem oil, 3 gm alum and 3 gm borax powder. Apply it on the boils. It cures piles in few days only. Take 50 gm of dried neem seeds, Persian lilac seeds, small Myrobalan, pure rasot and 30 gm roasted asafoetida. Grind them all into fine powder. Then mix 50 gm of seedless grapes in the powder. Mix these and prepare pea-sized tablets. Give 1-4 tablets twice a day. It cures all types of piles and also stops the bleeding. Take 50 gm camphor and 50 gm of neem seeds. Extract oil from these and apply a little amount on the boils of the piles. Within a few days, it dries th boil which gets healed after a few days. So, in this way we saw the numerous benefits of neem. Now, you must have got why this tree is sacred and worshiped in India. It is not any kind of illiterate works or doesn’t shows backwardness; but it the proof of divine Indian culture. Forests and nature are your green resources which are much precious than diamonds and gems. Today, many humans are blindly cutting trees to make infrastructures and buildings. They are no known that they are depleting the lives of upcoming generations with their own hand. Stop deforestation and encourage afforestation. Take care and live well! Is it good for diabetes ? Neem leaves are very effective and natural cure for diabetes. You can simply chew the leaves or take it in the form of juice too. It normalises the blood sugar with regular use. NEEM can TOTALLY Destroy BEDBUGS! The blood-sucking BEDBUGS are spreading fast all over the world in places of human habitations. They have become a great nuisance, as It is very difficult to eradicate them with the commonly used method of spraying insecticides. Their bites can cause severe itching, sleeplessness, depression, anemia and other related problems. Even by using different types of insecticides regularly, I had failed again and again to remove all the BEDBUGS from my room. ONLY after I started using NEEM soap and NEEM detergents to wash my bedsheets, pillow covers, blankets, mosquito net, and also to wash my clothes – shirts, pants, underwears, banians, nightdresses, caps, socks, handkerchiefs, towels, napkins, etc – did the BEDBUGS DISAPPEAR totally within a few days! We can use NEEM SPRAYS to kill and repel bedbugs, mosquitoes, mites, lice, fleas, ticks, cockroaches, ants, flies, etc. Washing our clothes with NEEM soap and NEEM detergents repels these insects. BATHING with NEEM soap and using NEEM creams and NEEM lotions too can help our bodies to repel bedbugs, mosquitoes, mites and lice, and to prevent diseases like ANEMIA, MALARIA, DENGUE, CHIKUNGUNYA, SCABIES, etc.